Occasions: Shopping, dating, traveling, office, business, trip,school...almost suitable for any occasion. Material: PU leather with high quality gold hardware. Dimension: 14.96*4.72*11.81 inches (L*H*W). Height of handle: 5.9". Structure&Capacity: 1 big zipper pocket in the middle, 1 smaller zipper pocket, 2 open pockets in the internal; 1 behind zipper pocket. Comfortable to hold your iPad, wallet, keys, cell phone and other things. Top zipper closure. Decorative hooks on both sides. Weight: 1.87 pounds. 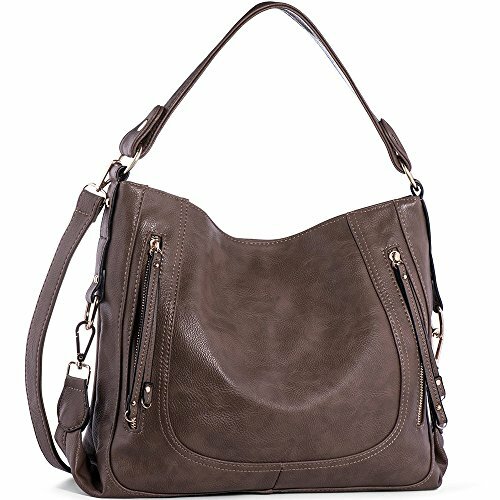 Multi-function: shoulder bag / top handle bag / crossbody bag / handbag.